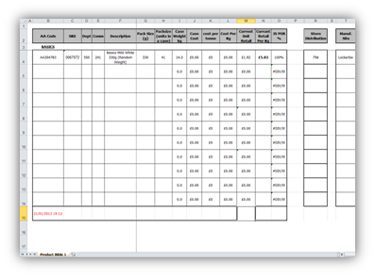 This is an essential automated report giving the user a full category snapshot on 1 easy to use double-sided sheet based on your market data. This report will provide a complete understanding of a category and its sub-sectors, reviewing key metrics including Super Category Share & Performance; Sector, Sub-Sector, Brand & Own Label Shares; Year on Year MAT & Quarter performance; Key Players share & performance; Innovation / NPD, Consumer Metrics etc. 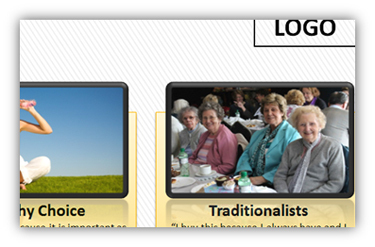 Do you want understand the true value of the growth opportunities in your sector or a sub-sector within your category ? 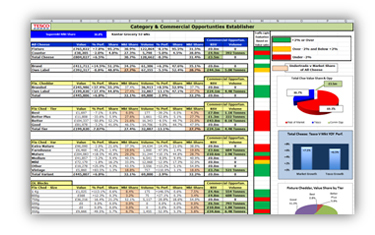 Based upon the way you and / or your consumers see the category using your market data, this automated document will allow you to understand the value and volume opportunity and quantify in volume and value terms, a clear direction for gaps and NPD. This is all effectively laid out on one easy to understand A3 document. 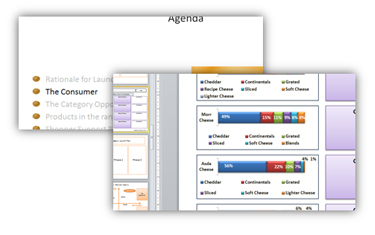 A vital part of any supplier relationship with a major supermarket in any sector is Category Planning, which is a joint process, usually with set templates and objectives within an agreed time frame. 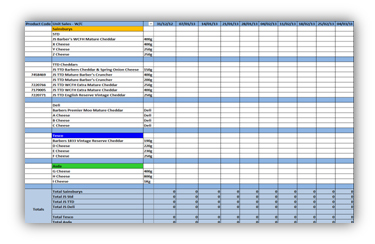 However for your own purposes our Category Plan will allow you to summarise and track the key performance indicators, joint objectives, new listings, promotions and your stretch targets by customer. I have found having a Consumer Decision Tree is an extremely useful tool to understand the process that a consumer goes through before making a purchase decision. 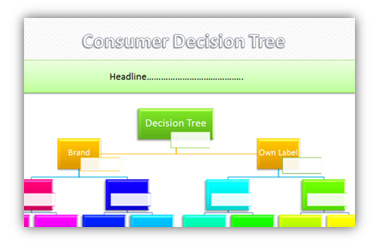 Our decision tree will allow you to map this process, which is very useful for understanding if your products are on the right track; it will enable you to understand where they are positioned in the eyes of the consumer and finally allow you to make the right decisions in terms of strategy, pricing, promotions and other KPI’s. Understanding the consumer and where each of the products sits in the category is useful to understand where to target innovation and growth. 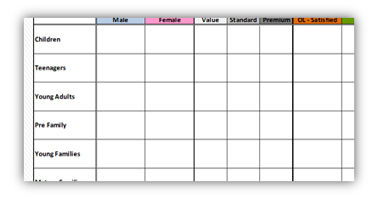 This matrix is a helpful and visual tool allowing you to map the category from a Shopper’s perspective and understand your competition. It is also a great start for a brainstorming session on what’s next. 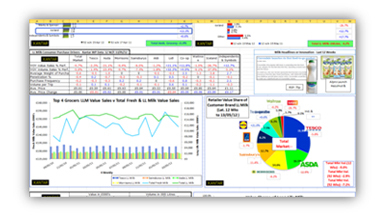 EPOS data is provided by most of the major supermarkets on your products and is usually a required term of trading – our EPOS Template will allow you to manage, update and track the EPOS sales of your brands and products, as well as providing automated Week by Week and in some cases day by day perspectives on share, performance and growth together with accompanying charts. You will be able to see this at line level built up to your total portfolio. When targeting a listing in a major supermarket, it is important to have a strong presentation to form the basis of your pitch to the relevant buyer. Using tried and tested methods our listings presentation will allow you to take control of a meeting, cover all bases and pitch effectively, gaining agreement from your target audience. Mapping your shoppers, who they are and what drives them when shopping your category is an extremely good way of helping you to sell more. Our Need States consumer map will help you to categorise the consumers in an effective way which can then be integrated into your strategy and objectives and help you make the right decisions. 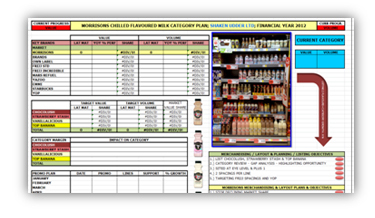 A simple but effective way of laying out all the key information on your products and brands from bar-codes to POR % and costings, in an Excel document allowing you to have key information which you will use on a daily basis in dealings with all food professionals in your network from buyers to supply plan managers.